Pakistan's jailed former prime minister Nawaz Sharif, his daughter and son-in-law were released from the high security Adiala Jail early Wednesday on parole to attend the funeral his wife of Begum Kulsoom Nawaz, who died in London. Kulsoom Nawaz died in a London hospital on Tuesday after a long battle with cancer. She was 68. Her body will be brought back here and buried in the Jati Umra Lahore residence of the Sharif family. Nawaz Sharif, his daughter Maryam and son-in-law Capt (retd) Muhammad Safdar, currently serving jail terms in the Adiala Jail in Rawalpindi after being convicted by an accountability court in a corruption case in July, were initially granted a 12-hour parole to attend the funeral. 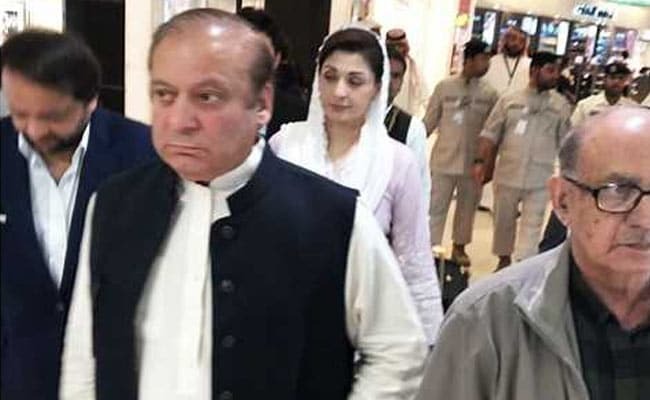 The three-time former prime minister, Maryam and Safdar were transported to Jati Umra on a special plane from Nur Khan Airbase Rawalpindi in the early hours of Wednesday after the Punjab government's home department issued their release order. The trio arrived in Lahore at 3.15 am Wednesday. Pakistan Muslim League-Nawaz spokesperson Maryam Aurangzeb told PTI that Sharif's younger brother and the party president Shahbaz Sharif had filed an application with the Punjab government requesting the release of his elder brother, niece Maryam and Safdar for five days on parole so that they could attend the funeral of Kulsoom Nawaz. "The extension will be in effect from midnight and will expire on Saturday night. In case of a delay in Begum Kulsoom's funeral, the parole will be further extended," the spokesperson added. Earlier, Prime Minister Imran Khan had ordered to facilitate the Sharif family regarding the bringing back the body of Kulsoom Nawaz and matters related to their parole. Kulsoom Nawaz who had been battling lymphoma for over a year, breathed her last at the London's Harley Street Clinic. Nawaz Sharif was in London with his cancer-stricken wife earlier this year when the anti-graft court had handed him a 10-year jail term and sentenced his presumed political heir, Maryam, to seven years in prison over the purchase of luxury flats in London in the 1990s. Nawaz Sharif is unable to meet visitors arriving at Jati Umra to extend condolences as his health deteriorated on Wednesday, family sources said. Kulsoom Nawaz will be laid to rest on Friday. The funeral prayers will be offered at the Regent Park mosque on Thursday afternoon and her body will be flown to Lahore after completion of legal formalities. Maryam said Tuesday night she was "deeply saddened" by the fact that she was unable to be by the bedside of her ailing mother during her last moments.